I recently purchased this app because in my Language program, students create their own individualized spelling lists each week based on high-frequency words they spell incorrect in their writing samples. I had started the year with a tic-tac-toe board and then one of the kids talked about loving word searches. 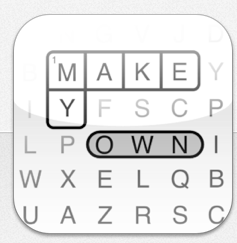 I googled to see if I could find an app for iPad where they can create their own puzzles…and here it is. My grade 2’s can create a puzzle with their 10 spelling words for the week within 10 minutes, they prints write from the app (no saving to photos) and you can embed the puzzle (but you can’t do it online). My kids have been begging to do more homework so they can create more puzzles! There are options for word searches and creating crossword puzzles where kids have to create their own hints and then would give it to a friend. What better way to assess their knowledge of topics in science, social studies, non-fiction text features, etc. than to have them need to create their own hint and provide an answer! I have also played with turning it into a math word search as well. There is no discount for bulk purchase of the app…it is $1.99. I stumbled across your article and greatly appreciated that the app has found a good home. After reading your article, I went and looked into it and believe I have now enabled the educational discount. Thanks for the article and hope your students continue enjoying the app.